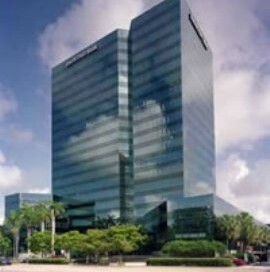 1 East Broward Owner, LLC, a joint venture between affiliates of NAI/Merin Hunter Codman and PCCP, LLC, has acquired 1 East Broward, a Class A office tower in downtown Fort Lauderdale for $108,500,000. The CBRE Capital Markets team facilitated the sale of the 19-story, 351,705 square foot, institutional-quality office building on behalf of the seller, Ivy Realty. Additionally, the CBRE Debt & Structured Finance team arranged acquisition financing of $77,465,500 with SunTrust Bank on behalf of the buyer. Vice Chairman, Christian Lee and Senior Vice President, José Lobón of CBRE oversaw the transaction on the sale effort, and First Vice President Amy Julian oversaw the financing for CBRE, working with Chief Financial Officer Dung Lam and Acquisitions Director Corey Winsett on behalf of NAI/Merin Hunter Codman. The CBRE team also included Senior Financial Analyst Andrew Chilgren. Rebecca M. Cox, SunTrust Senior Vice President, provided the financing. Kapp Morrison LLP provided legal counsel to the seller and Shutts and Bowen provided legal counsel to the buyer. The property is located on the northeast corner of Broward Boulevard and Andrews Avenue, in the heart of Fort Lauderdale’s rapidly expanding downtown, across from the new Brightline Rail Station. The 91% leased property includes a 19-story building and a 5-story building that are connected by a covered sky bridge to a 4-story parking structure that provides the office tenants with 772 covered parking spaces. The property recently received an extensive renovation with over $4.9 million invested since the beginning of 2013 and serves as the new U.S. headquarters for KEMET Corporation, a leading publicly-traded global supplier of electronic components. KEMET recently relocated its corporate headquarters from Greenville, SC to 1 East Broward bringing 150 additional jobs to the Fort Lauderdale CBD. KEMET joins several leading law firms who have corporate and regional headquarters at 1 East Broward including Becker & Poliakoff, Quintairos, Prieto, Wood & Boyer, P.A., McGlinchey Stafford and Hinshaw & Culbertson LLP. The purchaser of the property, 1 East Broward Owner, LLC is a joint venture between affiliates of NAI/Merin Hunter Codman, Inc. and PCCP, a real estate finance and investment management firm, based in New York and San Francisco that has over $6.5 billion in assets under management on behalf of institutional investors. NAI/Merin Hunter Codman will take over property management and leasing at 1 East Broward.